We are Jim and Melissa Lakey, a husband and wife wedding filmmaker team. We love shooting weddings in the desert that we call our home — Joshua Tree and Palm Springs — but we’re also partial to weddings at the beach. And in the woods. And in the city. We’re pretty sure we’d love shooting in Hawaii, too, if anyone would like to put that to the test with us. Melissa is from Idyllwild, California, and Jim is from England. These days, we live on a mesa next to Joshua Tree National Park. We landed here in 2015 after a road trip around the United States. We were looking for a place to settle down and get inspired, and the High Desert really spoke to us. There’s a kind of magic out here that attracts artists, musicians and all kinds of dreamers who like big skies, wide open spaces and starry nights. We both have a background as filmmakers—Jim studied fine art, specializing in video, and Melissa has several years experience working on independent films. 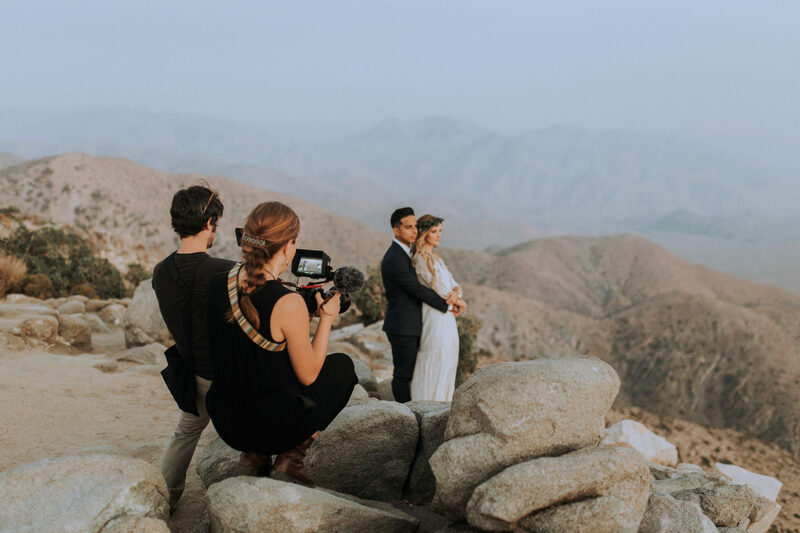 But it wasn’t until after our own wedding—inspired by how special the day was and how quickly it went by—that we decided we would love to use our skills to film other people’s weddings. Want us to shoot your wedding film? Get in touch. We’d love to learn about you and your wedding plans. Our goal is to make a film that celebrates the two of you as well the family and friends (and often dogs) that join you for your special day. Check out our reviews on Google and yelp to find out what couples who hired us have to say!